The hard part of dealing with student loan debt isn’t making payments on it. The hard part is navigating the complex world that is the student loan repayment system. There are multiple repayment plans, student loan forgiveness programs, different options offered by each state, and more. I’ve been talking to roughly 5-10 people a day lately about their student loan debt. And every story is similar: I have this debt, and I want it gone. Of course you do! I want it gone for you! But where do you start? Today I wanted to break down the best strategies that you can use to erase your student loan debt. Maybe these relate to your situation and you can follow this guide today. Not all of these will eliminate your total student loan debt, but each solution can help. The first way to eliminate your student loan debt applies to people with Federal student loans. These are student loans that are typically handled by the Department of Education or one of the student loan servicing companies. These include many different student loan programs handled by the Federal government. There are three major, and several smaller student loan forgiveness programs. The most popular Federal student loan forgiveness program is Public Service Loan Forgiveness. This program offers student loan forgiveness to people who work in public service for 10 years. Public service not only includes government jobs, but it also includes many non-profit jobs, education jobs, and service jobs like law enforcement or public safety. The other two common ways to get Federal student loan forgiveness is to be a teacher, which has it’s own Teacher Loan Forgiveness Program (which doesn’t cover as much as PSLF), and military service loan forgiveness (which is also being phased out due to the PSLF program). Many states also offer various student loan forgiveness programs for your student loans. 46 out of 50 states offer at least one program, with some states offering many different programs to cover a wide variety of loan types, employment, and more. In fact, Kansas offers student loan forgiveness of up to $15,000 for just living in certain parts of the state. California, for example, offers student loan forgiveness for doctors, health professionals, and dentists. Meanwhile, Texas offers student loan forgiveness for professors, speech therapists, nurses, doctors, teachers, and lawyers. Before you give up on not qualifying for Federal loan forgiveness programs, check your state and see if they offer any incentives or assistance: Student Loan Forgiveness by State. Did you know that more and more employers are offering tuition reimbursement to help their employees pay for school. It’s one of the ways that I paid for school – because I worked full time while getting my college degree. Some companies, like Starbucks, even offer their employees full degree programs as part of their employee benefits. Even better, some companies are now offering their employees Student Loan Repayment Programs – where the company is paying off portions of their employee’s student loan debt. Working during college is one of the smartest moves that any student can make. But if you’re already working, why not make sure that you’re taking advantage of all your employers benefits and see if you can’t eliminate or erase some of your student loan debt with a tuition reimbursement program. Many of these programs require you to pay up-front (thus take out student loans), and then provide proof of course completion to your employer. Once you’ve completed the class, your employer will typically reimburse you through your paycheck. Already done with school and buried in student loan debt? Some employers offer signing bonuses and other perks to potential employees. But you have to ask. Along with negotiating that first salary after graduation, you need to see if you’re employer will offer you any help with your student loan debt. The next option to try to help you eliminate your student loan debt is to consolidate your Federal student loans. Now, while consolidation by itself won’t help you lower your payments or your student loan balance, what it will allow you to do is to be financially organized. When you start college before your Freshman year, you’ve likely already signed up for your first student loan. Then, you sign up and receive a new student loan each year. And if your Federal student loan doesn’t cover the full balance of your tuition, you likely have private loans as well (which we’ll cover below). That means you could have four or more different loans and payments. How confusing! To make matters worse, each of these loans could have a different payment amount and due date. If you mess up one payment, you could harm your credit score and be hurting your financial future. That’s why simply consolidating and organizing your student loans is so important. If you want to be coached through the process, check out our program Ditch Your Student Loan Debt. The next step in eliminating your student loan debt is to find a repayment plan that matches your ability to pay. After you graduate, you are automatically enrolled in the Standard Repayment Plan. This is 10 years of even payments – which may not work for all borrowers. The trouble is, many graduates don’t know that they can change this plan – they just assume they are stuck with that student loan payment. 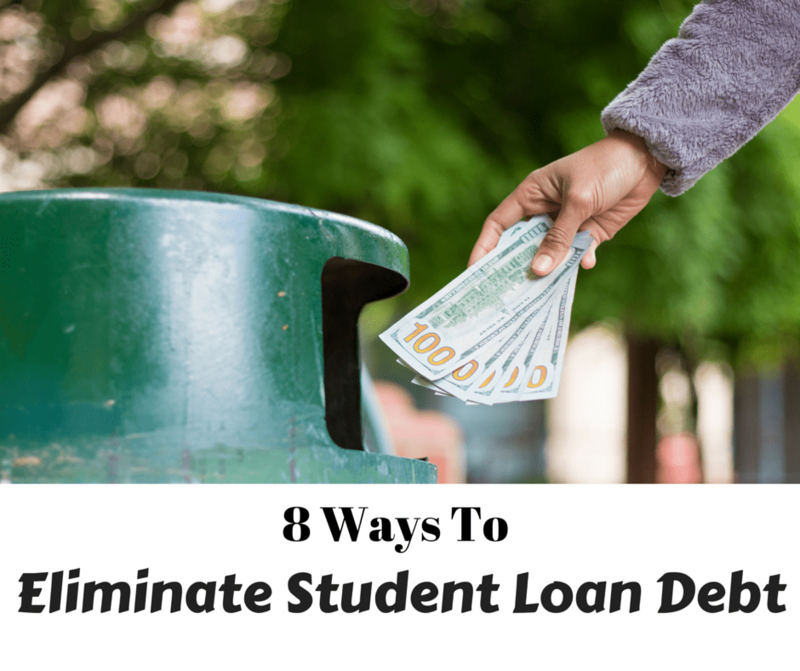 If you have Federal student loans, there are many repayment plans that could help you make your student loan debt more manageable – which, in turn, will help you eliminate your debt faster. If you plan on your income going up in a few years after graduation, you could look at a repayment plan like Graduated, which has a lower up-front payment that rises over time. If you want a lower monthly payment, but are okay with paying it over a longer time, look into the Extended repayment plan. When selecting a repayment plan, if any of the above Standard options still don’t work, Federal loans offer income-based repayment plans. There are several versions of this, but the most popular are Income-Based Repayment (IBR) and Pay-As-You-Earn (PAYE). The great thing about IBR and PAYE is that they offer a “secret” benefit – student loan forgiveness. Many people don’t realize is that both of these plans offer student loan forgiveness at the end of the repayment term. Any remaining balance on the loan will be forgiven, but unlike the other Federal student loan forgiveness plans, you will owe taxes on the amount forgiven. Either way, this is an excellent benefit. With both of these plans, you simply provide proof of income, and the Department of Education calculates a monthly payment for you that is 10% of your discretionary income. That means your monthly student loan payment will be affordable! You do have to resubmit your income annually, and your payment could rise as your income rises. If you’re in Public Service, signing up for IBR or PAYE and combining it with PSLF is one of the best ways to minimize your student loan debt. If you have private student loans, the best way to start eliminating this debt is to refinance your private loans at a lower interest rate. This will not only save you money in interest over the life of the loan, but it will also lower your payment up front. One of the best tricks is to refinance your loans at a lower payment, but continue paying your previous payment amount. This could potentially shave years off your loan, saving you hundreds or thousands of dollars. One of the best ways to go about refinancing your student loans is to look at a comparison tool like Credible. Credible helps your receive and compare offers from multiple lenders after filling out a single form, allowing you to find and select the loan with the lowest interest rate and best terms. As a bonus, College Investor readers can get a $200 bonus when they refinance with Credible! One of the biggest concerns about private student loans is that most private student loans are variable rate. We’ve put together an in-depth explanation of variable rate private student loans, and how, in most scenarios, the money saved by the lower up-front payment is almost always worth it. It’s only in very rare circumstances where your variable rate payment will be higher than your fixed rate payment. Finally, if none of these options work (or none of them totally eliminate your student loan debt), the next best thing you can do is earn more money. I’m a firm believer that everyone can earn an extra $100 per month if they try to. That extra $100 per month can be applied to your student loan debt, eliminating $1,200 per year from your loan balance! Don’t know where to start? You can easily start by earning extra money doing things that you already do, or you can pick up one of these 50+ side businesses. The options are endless. Check out our full guide on earning extra money here. It may sound counter-intuitive, but earning more is a great way to pay off student loan debt. In fact, the aspiration to earn more money was probably the reason you went to school (and took out student loans) to begin with. What other tips and tricks do you have for eliminating student loan debt? I agree with tips 5 & 8. When I started to pay back my loans the monthly payments were $540. I was able to make those payments I didn’t feel stressed or ever have to rebudget anything. If I wanted too, I could add additional principal payments. I never did though and looking back I should have. And recently I paid off my consumer loan by making 3 (very large) extra principal payments and I was able to do that because I was making more money. Thanks for stopping by and sharing. Making extra payments goes such a long way to eliminating debt – even if you can’t do it consistently, it really helps. I agree with number 8. Over 40% of the total student loan debt in this country is held by people who completed graduate programs. While graduate students have a much higher income potential than their undergraduate brethren, they also leave college with a much higher amount of debt. We all know life has a funny way of throwing you curveballs…one day you can be paying off your student loans, the next day you can be seriously injured and can’t afford paying back your loans. Using LTD or life insurance is a good way to protect yourself and help eliminate paying debt, in the face of a setback. If you’re earning more money, it’s wise to protect yourself. Having insurance, especially with private student loans, can make a lot of sense. Thanks for sharing. Hey- Hey I just became disabled but I owe a buntch of Federal student loans from going to College! Is there a way I could get out of of them b/c of my disability! Can you recommend any crowd funding sources to eliminate student loan debt? I’ve been paying interest only on my student loans for the past ten years. I’ve never been in a financial position to increase the payments, and so I still owe the same amount I did ten years ago, despite the $300 a month payments. I tried loan forgiveness, but even though my school and position qualifies, I was disqualified due to the date of disbursement, which was prior to the qualifying date for the federal loan forgiveness program. Any suggestions would be appreciated. What type of loan do you have? How much longer do you think you’ll need to make payments? If it’s over 10 years, I suggest consolidating your loans again into a Direct Consolidation Loan, and then taking advantage of PSLF. I have over 60k in federal student loans. I did not finish due to work/parenting conflicts. I attended an online school. I work for my parents business as “in kind” labor so I dont make a pay check. I’m a single mother and am already working 50+ hours a week. I’m in Texas. I read the article but for me, what would be a good will to start? I’m on government assistance. I’ve had the loans in forbearance for 6 years at least. I would go get a job that pays but that would mean an end to my parents small business and they cannot afford the payments. Get on an income-driven repayment plan. If your income is $0 or very low, your legit student loan payments would be $0 per month. Then, you would start the process towards forgiveness. I have been a teacher in a Missouri public school for 20 years. We have been in a salary freeze for the past 8 years. Before that, we were in 3 other salary freezes. Even though I choose to be in this school for my economically challenged students, I cannot make the payment Fedloan wants. These payments are income-based, but I cannot pay the amount. I own my own home and have a car. I feel that I need to sell everything to make the loan payment on my graduate degree. I cannot find a way to lower the payment, even though I offered to pay the entire loan off instead of taking the deal of having the rest of the loan forgiven after 10 years of payments. Currently, I have been in deferment for 1.5 years. The loan is growing and I am still making the same salary. I am drowning. I truly wish I could return the degree and just forget the whole thing. It is one of the worst decisions I have made–going back for a graduate degree. Are you positive that your income is certified correctly for your payment plan? If so, your payment is capped at 10-15% of your discretionary income. That’s a pretty reasonable payment that could be as low as $0 if your income is low enough. It sounds like you might be drowning in all your budget – not just your student loans. Are there other items in your budget you can cut to make your payments? Continuing to defer your loans only hurts you. If you start making payments on a qualified repayment plan, you can potentially get your loans forgiven under PSLF in 10 years. However, you’ve already lost 1.5 years not pursuing this! I graduated vocational school in 2010 and still have a bunch of student loans even after paying for up to 36 months. Is there anyway I can get them off? There are a lot of repayment programs and forgiveness programs, but even the shortest ones are 10 years. The only way you’re going to get your loans paid off faster is to put a lot of extra money towards them each month. Thank you for this. I have over 90K in student loans. I’ve been in IBR for 5 years and my interest levels and not paying has brought it up 10K. I work for a non-profit university so I qualify for the PSLF BUT I’m only an adjunct to it says I am part-time. I don’t think I can qualify? Is there ANY other type of forgiveness program? Finally, is it best to just pay the whole thing off if I sell my condo and give the Dept of Ed all of my profit? I’m just not sure if I should just pay it all off or try for more IBR and forgiveness. What are my options??? Can you work part time at another non-profit or school? You can combine two part time jobs to get PSLF. Can you side hustle and earn more? Then use that to pay down the debt? If you can afford to pay more, that’s a great way to get out of debt. If that’s not possible, then the path you’re on is likely the best. I am a recent M.B.A. graduate and I have accumulated over 50,000 dollars in student loans. I just started making monthly payments and I can already tell that it is just enough to cover interest, as the total amount is only going down by a few dollars. Any advice on how to get rid of these loans faster? Also, is working for a college/university considered to be a public service? Any advice would be helpful. If you want to pay off your loans faster, it’s all about earning more. Check this out: Pay Off Your Student Loans Faster. As for public service loan forgiveness, if you are employed by the college full-time, then yes! Here’s a guide: The Ultimate Guide To Public Service Loan Forgiveness.